Etching House for Margaret Olley limited edition fine art etchings, prints, Giclee prints and works on paper. Lay Buys welcome up to 12 months at 20% deposit, no fees. It is with great sadness that today the 26th of July 2011 the world of fine art has lost the darling of the art world. Only weeks ago we personally had the pleasure of spending time with Margaret Olley in the Presence of Charles Blackman, Garry Shead, Jason Benjamin. Margaret Olley was as always her charming and ever so delightful self with a smile that would melt you in a moment. Margaret spoke happily about here work and love for color, she also spoke about how she doesn’t like Telephone companies and digital things. 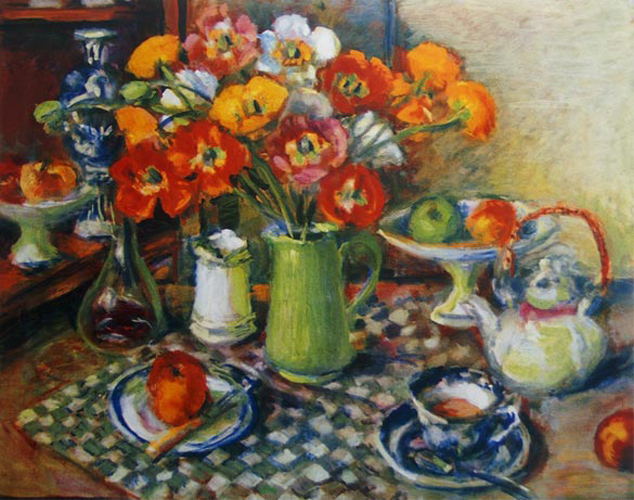 Margaret Olley AC, AO 1923 – 2011, passes way to day 26th July 2011, a truly sad loss. Etching House buy, sell and trade original paintings, etchings, by Margaret Olley. 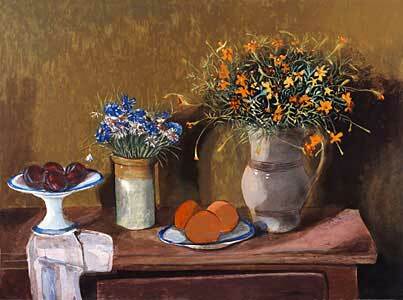 Born in Lismore 1923, Margaret Olley is renowned as one of Australia’s most prized interior and still life painters. Demonstrating a fierce disregard for trends and fashions, Olley’s exquisite arrangements of flowers, fruit and objects seduce the viewer with their technical virtuosity and inherent grace. Her arrangements are always elegant, the objects always beautiful. Complexities of space and light are rendered with consummate skill. Olley’s subjects are almost always from her own home – itself famous as an exquisite work of art. She first came to public attention as the beguiling subject of Dobell’s winning Archibald portrait in 1948, and these days is regarded as a national treasure. 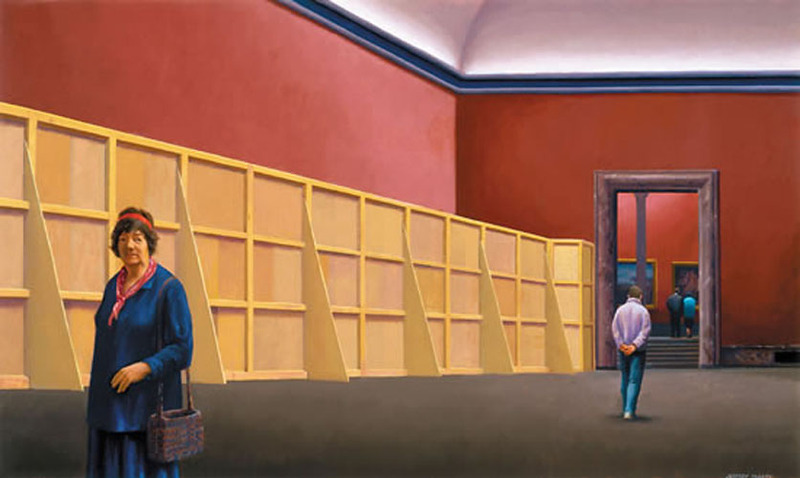 In 1997 her work was the subject of a major retrospective organized by the Art Gallery of New South Wales. Margaret Olley AC, AO at Etching House. 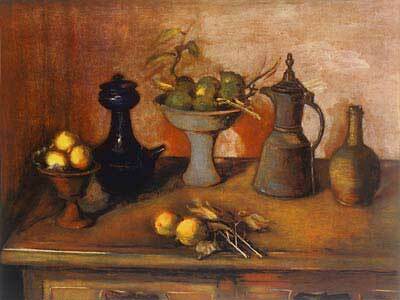 Margaret Olley AC,, AO Fine Art, Etchings and Prints at Etching House. Margaret Olley AC,, AO Fine Art, Etchings and Prints at Etching House Weekend Australian Affordable Art Show Sydney, Stand A10. Margaret Olley AC,, AO Fine Art, Etchings and Prints at Etching House Weekend Australian Affordable Art Show Melbourne. From the 1970s, the quantity of Olley’s output of landscapes and portraiture declined, and she narrowed her subject matter to still-life and interiors. With painting as her focus, her work took on the rich sensuality and color which is clearly evident in this recent painting. In the late 1980s, Olley travelled overseas to Asia and Europe. Her work at this time reflected much of the influence of her travels, as she built on her own experience and painting by viewing the work of artists she most admired. Although subtly echoing elements of the work of Matisse and Bonnard, Olley’s work essentially filled a niche in the realm of Australian painting and led the way for younger Australian painters. Olley has successfully manipulated her paint to reflect her love of all things of life. She has given permanent vitality and beauty to a subject of which most of us are guilty of overlooking. Margaret Olley AC, AO, Smart, Olsen, Shead, Lindsay Etchings and works on paper at the Etching House Sydney Affordable art Show. Margaret Olley AC, AO fine art limited edition print works on paper by Jeffrey Smart at Etching House, the work is titled “Margaret Olley in the Louvre Museum 1994-1995” at the Affordable art Show 2010. Margaret Olley AC, AO Fine Art Collections include: Australian National Gallery, Canberra; Art Gallery of New South Wales; National Gallery of Victoria; Art Gallery of South Australia; Art Gallery of Western Australia; Queensland Art Gallery; The Tasmanian Museum and Art Gallery; Newcastle Regional Art Gallery; Rockhampton Art Gallery; Toowoomba Art Gallery; Bendigo Art Gallery; Lismore Regional Art Gallery; Maitland City Art Gallery; Wollongong City Gallery; Brisbane City Hall Art Gallery and Museum; The Centre Gallery, Gold Coast; Art bank; University of NSW; University of Sydney; Canberra School of Art Gallery; Brisbane College of Advanced Education; The Queensland Teachers Union; University Art Museum, University of Queensland; Canberra College of Advanced Education; Australian National University. Etching House has available a collection of Margaret Olley limited edition fine art etchings and works on paper. Etching House Lay Buys welcome up to 12 months at 20% deposit, no fees. 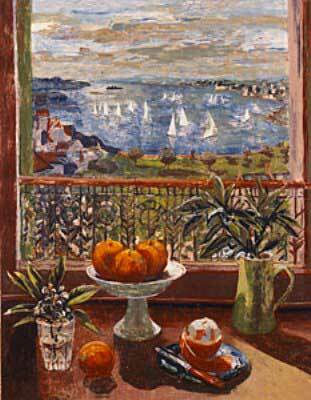 Framed Margaret Olley art works from Etching House are delivered by Woollahra Art Removals Australia. For all Margaret Olley Fine art – original paintings, reproduction fine art limited edition prints, etchings needing collection or delivery with in Australia or overseas, Etching House use Woollahra Art Removals who are one of Australia’s most established and respected art removals specialists. After 36 years of operation there going through some exciting changes that will allow their customers to enjoy the very best in fine art transport logistics and customer service. There delivery schedule is expanding. Today they offer customers a true national reach, with increased frequency between key destinations; Brisbane, Sydney, Melbourne, Adelaide and Perth. Leading there operations is National Manager Paul Cartwright. With 17 years’ experience with Woollahra, Paul has gathered an encyclopedic knowledge of the art market in Australia, while maintaining an exceptionally high standard of customer service. What hasn’t changed is their name, their reliability and the fact that there’s no one else you can trust more with your precious artwork than Woollahra Art Removals. Get the best in fine art transport and save! Margaret Olley Fine Art limited edition reproduction print titled “Basket of Oranges Lemons and Jug” in large and extra-large size, signed lower right, Margaret Olley 2011, certificate of authenticity provided at Etching House. Margaret Olley Fine Art “Basket of Oranges Lemons and Jug” in white frame at Etching House Melbourne annual affordable art fair Carlton May 2011. NEWS – See Australian iconic Artist Margaret Olley Interview with Ben Quilty at the Archibal Prize presentation at the New South Wales State Art Gallery. Margaret Olley huge portrait by Ben Quilty wins Archibald Prize 2011 New South Wales Sate Gallery Sydney. Margaret Olley fine art Australian limited edition etchings, reproduction digital fine art prints hand signed at Etching House. Margaret Olley original paintings bought and sold at Etching House. 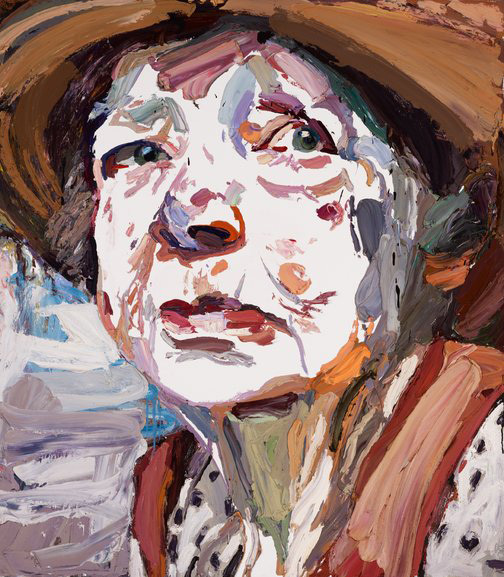 See this year’s winning portrait by Ben Quilty of Margaret Olley alongside 40 finalist works, including portraits of Australian identities such as Waleed Aly, Cate Blanchett, Quentin Bryce, Cathy Freeman, Jessica Watson and Hugo Weaving. Finalist artists include Del Kathryn Barton, Adam Cullen, Lucy Culliton, Ken Done, Nicholas Harding, Jenny Sages, Jiawei Shen and Tim Storrier. Visit the exhibition and vote in the People’s Choice award. ARCHIBALD-INSPIRED EVENTS See Margaret Olley Portrait by Ben Quilty, Etching House recommends highly visiting the New South Wales Archibald Prize collection, also the gallery has a spectacular collection of Australian Fine Art, a great day out. Ben Quilty met Margaret Olley when she was a guest judge for the 2002 Brett Whiteley Travelling Art Scholarship, which he won. ‘She’s been a friend and great supporter of my work ever since,’ he says. Australian iconic and up and coming artists………. Margaret Olley, Garry Shead, Jason Benjamin, Melissa Egan, Kerrie Lester, and Charles Blackman will be at the New South Wales State Library Sydney 12th of May 2011, the event will be have a guest speaker Edmund Capon director of the state gallery of New South Wales who will be welcomed by Richard Neville Mitchell Library. This event is a celebration in honor of 30 years of service to the art world by Berkeley Editions. Australian iconic artists Margaret Olley, Garry Shead, Jason, Benjamin, Melissa Egan, Kerrie Lester, and Charles Blackman attending the 30th year calibration for Berkeley Editions at the state Library of NSW are all Australian artists who also specialize in making fine art limited edition etchings and prints available at Etching House. Fine Art and etching and print artists like… Margaret Olley, Garry Shead, Jason, Benjamin, Melissa Egan, Kerrie Lester, and Charles Blackman attending the 30th year calibration for Berkeley, hosted by the State Library Sydney, 12th May 2011, Etching House will be there. Dont miss out on the complete interveiw with margaret Olley and Ben Quilty at the State gallery of New South Wales, Etching House is amember of the State gallery NSW. Margaret Olley and Rolf Mende from Etching House chat at State Library NSW Berkeley’s 30th year celebration. The ever charming and delightful Australian artist Margaret Olley graciously chatted with Rolf Mende from Etching House, Margaret said she spent her early days living in Tully far north Queensland, during the second world war Margaret Olley moved to Sydney where she has been ever since, Rolf asked her how do you see the world of digital, she replied, I don’t like any of that, I don’t have mobiles or any digital things at all, the telephone companies are always charging so much. Her spirit and feel for the art world is ever so alive, I said that Jeffrey Smart has seen the opportunity to share his work of originals with the public at very affordable prices by making them a limited edition fine art print, Rolf said that his original works are mostly in private collections therefore not all openly available to the public to see or enjoy, Margaret said yes, Jeffrey Smart is just a wonderful urban landscape artist, Rolf commented that with my experience of dealing with the general public I have been amazed how many people of all ages now know and love Jeffrey Smart’s work, I said there is not a lot of money in what we represent with fine art prints, we do it more as a passion, it’s also important to keep things affordable and put something back into the art world. Margaret has a killer smile that melts you and her persona is so evident in her beautiful paintings and prints. 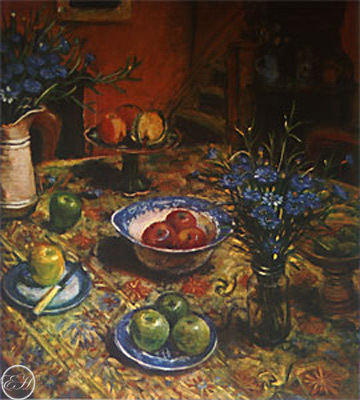 Margaret Olley fine art prints at Etching House. When you talk to Margaret about her oil paintings and the choice of colors her face lights up and her passion and attention is so real. She is just delightful and as they say the Darling of the Australian art world. It has been the objective of Etching House to retail where possible the work of Margaret Olley and share it with the Australian public as much as possible, Etching House has had successfully done this with works by Norman Lindsay, John Olsen, Garry Shead and Jeffrey Smart all through affordable fine art work and limited edition reproduction prints, etchings. Etching House specializes in Margaret Olley 1921-2011 fine art and Australian limited edition prints and etchings, Margaret Olley print and etchings in stock now in limited numbers at Etching House is the new print titled Basket of Oranges Lemons and Jug which is hand signed by Margaret Olley. Margaret Olley 1921-2011 legendary painter did what she loved, painting, she worked passionately till the end, her brushes were laid to rest once more, as she did her time unbeknown had come. A sad loss for the darling of the art world, respected and loved by all her knew her, the art lovers couldn’t have enough of her work, collectors bought for investment then quickly fell in love with the work putting aside the investment strategy. Margaret Olley was awarded the Order of Australia in 1991 for service as an artist and to the promotion of art. In 1996, Margaret Olley was awarded the Companion of the Order of Australia. Margaret Olley donation of fine Australian art to the Australian public was exceeding generous, her love of the art world was shared with the Australian public once more with the win of the Archibald by her friend Ben Quilty. Etching House specialize in Margaret Olley digital fine art reproduction Giclee prints and etchings hand signed by Margaret Olley, the special edition made in Giclee has been well received in Melbourne Affordable Etching House annual art fair May 2012 Royal Exhibition Building Carlton Victoria – art show. 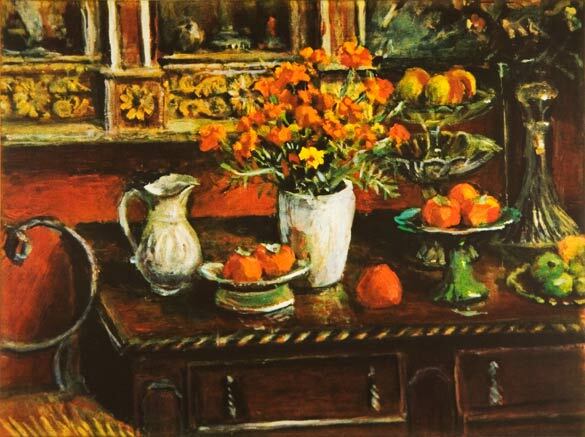 The 150 limited edition Margaret Olley Giclee limited edition digitally reproduced print of the original painting “Basket of Oranges Lemons and Jug” has proven to be a successful edition, the extra-large version of “Basket of Oranges Lemons and Jug” fill a great space on any wall and is affordable at Etching House.